Recently there has been more attention paid to the younger passengers, the so-called millennials, and their role and interest in cruising. So this week we take a quick look at what is happening in the cruise market for 18-34-year olds. The Russians, meanwhile, are busy getting back into the cruise business with a newly-acquired cruise ship to serve Crimea. And the latest edition of Stern’s Guide to European Riverboats and Hotel Barges is now available. A millennial (what we might have called a young person in an earlier age) is defined as a person reaching young adulthood in the early 21st Century. Researchers typically use people born in the early 1980s as a starting point to the mid-1990s to early 2000s as a closing point. Today, this might be described as 18-34. According to CLIA, as recently as 2011, the average age of cruise passengers topped 50 and only 7% were between 25 and 29. But the average age of cruisers has now dropped quite significantly, from 56 in 2002 to 46 in 2015. In another recent US survey, millennials constituted the age group most interested in cruising, with 53% saying they would like to take a cruise within the next two years. This is a higher rating than any of the Generation X, baby boomer or mature travellers groups. Last month, the social media analytics company Crimson Hexagon decided to do their own study of what millennials wanted from a cruise by exploring what they were saying on social media such as Facebook and Twitter. Crimson Hexagon’s Mike Baker concluded that while older travelers (35+) chose cruises to experience low-key, exclusive, family-oriented relaxation, millennials (18-34) tend to look for an entertainment-heavy, cost-effective way of meeting new people. The baby boomer generation represents approximately 70% of all disposable income in the US today, but millennials will become increasingly more important as they age and their income rises. Baker adds that when millennials react negatively to cruises on social media, it is often because the entertainment options are not varied or current enough. Conversely, when millennials express positive emotions about cruising, it is often centered around the entertainment offered on the cruise, rather than the cruise itself. But appealing to the millennial traveller is something many cruise lines have been struggling with because access to onboard internet continues to be slow and expensive, and itineraries are often too long for millennials. In Europe, MSC Cruises has signed a deal with Samsung to equip its newest ships with smartphones, and has installed Bluetooth technology on one ship to enable passengers to locate each other and staff to tailor messages based on where travellers are. Meanwhile, Carnival Corp & PLC this month unveiled its Ocean Medallion technology. This is the world’s first interactive guest experience platform to introduce a highly personalised level of customer service. The new technology will allow instant embarkations, ordering drinks and other amenities, keeping tabs on fellow travellers, opening cabin doors without a key and the ability to communicate preferences to the crew wherever you are on the ship, among other things. The first ships to receive this technology, which has been adapted from Disney and means the installation of 700-odd sensors throughout the ship, will be three of the Princess Cruises fleet. The 3,560-berth Regal Princess will be the first to be so equipped, this November, and she will be followed by sister ship Royal Princess, in January, and the 3,114-berth Caribbean Princess, in March 2018. There was a time the Russians and Ukrainians (then known as the Soviets) had what they claimed was the largest cruise fleet in the world. They operated ships that could not only carry troops but also earn hard currency in the western cruise market. This all disappeared with the collapse of the Soviet Union and perhaps the last such ship was the 788-berth Maksim Gorkiy, which was active in the German market until finally being scrapped at Alang in India in 2009. But the Russian Ministry of Transport has now held preliminary talks with Sovfracht Group and Rosmorport to launch regular passenger service to the seaports of Crimea. 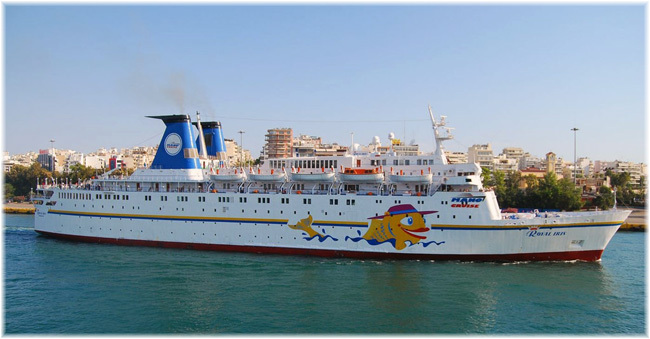 To implement the project this year, the Ministry plans to acquire the 770-berth cruise ship Roy Star (formerly Royal Iris). Provisional estimates show the project may cost around 700 million roubles (about $12 million), including vessel acquisition and refurbishment. Estimates for cruise ticket costs are something around 4,500 roubles (about $78) per person per day, which is comparable with the cost of a room in the 3-star hotels in Sochi or Yalta. The project was begun in September 2016, after Russian President Vladimir Putin ordered the Ministry to organize regular air and maritime traffic between Sochi and the Crimea for the 2017 tourist season. In late December, Deputy Minister of Transport and head of Rosmorrechflot Victor Olersky chaired a meeting of the Russian Marine Board on establishing a regular passenger service to the ports of Crimea. The only company that was interested in launching the service was Sovfracht Group and it is now in talks with the Ministry of Transport. The Ministry of Transport experts said the most effective solution would be a regular cruise line on the route Sochi – Novorossiysk – Yalta – Sevastopol – Istanbul – Sochi. The cruise ship will fly the Russian flag. Since the service includes calls at the ports of Crimea, which is under sanctions, time charter has been ruled out. Therefore, the Ministry proposes to purchase the ship. This ship was built in 1971 for P&O’s Southern Ferries as the long-distance ferry Eagle, and when that failed she passed in to other owners such as Chandris and Festival Cruises under the names Azur and The Azur. 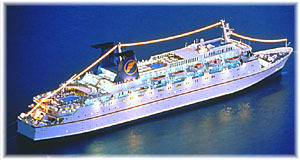 As the Royal Iris, she then operated for an Israeli venture. She is the only survivor of three sister ships that once also included Paquet Cruises’ Massalia and Fred. Olsen’s Bolero. The latest issue of Stern’s Guide to European Riverboats and Hotel Barges featuring updates on all river cruise operators, is now available. This comprehensive guide includes descriptive information for every European riverboat and hotel barge, inlcuding statistics, stateroom size, descriptions of public areas, dining, shipboard facilities, and itineraries. Each vessel is evaluated for comfort and luxury. Hundreds of photos of vessel exteriors and interiors are included, as well as sample menus and daily programmes. Several chapters are also devoted to descriptions of the cities and villages visited by these riverboats, and the regions and villages visited by hotel barges. The book can be acquired through Amazon, Barnes & Noble, book stores and other Internet sights.